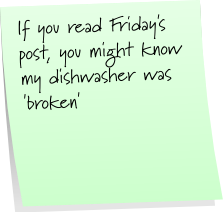 Post It Note Tuesday! 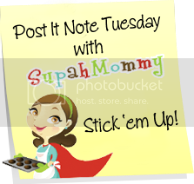 You probably already know the drill, but if not, go to SupahMommy's blog to play along. 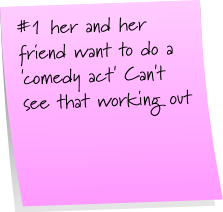 And make your Post It Notes by going to Superstickies. I am with you. Everything always seems to happen on the day my daughters are already doing something. I would take her out too. Dance classes are crazy expensive here too! I just started doing this today - looks like fun. My kids school things always fall on a Tuesday which is hard because they all have soccer practice that night too. I'm sure you've saved her from years and years and years of pain and embarrassment. You did the right thing! You are so right about the school always choosing Thursdays for everything! I hated that! 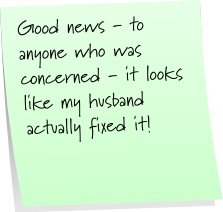 Isn't it nice to have a handyman Hubby around the house? Nice he was able to fix your dishwasher! My husband is good at fixing things when he does it. The hard part is getting him to start something. Thank you for stopping over today. 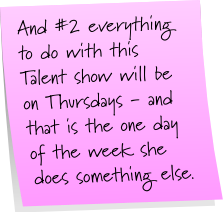 I love Post It Note Tuesday only I am gone most of the day so I don't read most of them until Wed. Your daughter does need to keep going to her classes that you pay for. How is she handling you not letting her participate? 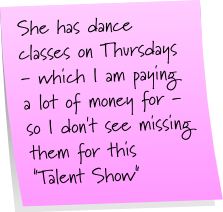 If I was paying for something else then she would have to do that instead of the talent show. Being a Mama is so hard. It seems like school activities are on the same night like their after school activities in my house as well. I try to take turns, but it's hard. I was asking the same question to myself. All the school activities on Thursday! Schools certainly have a way of making themselves inconvenient. 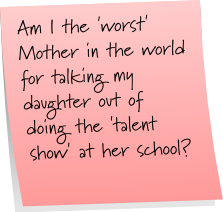 I guess I'd let her do the talent show, even if it means she might fall on her face just so she has the experience. Who knows, she might surprise you. OTOH, if they do a talent show every month, I might skip it.